This April saw the most gun-related background checks of any April on record, making it the 12th month in a row to achieve a high water mark for gun sales. The FBI ran 2,145,865 checks through the National Instant Background Check System last month, according to the agency's records. That represents more than a 400,000 increase over the previous record set in April 2014. Though the numbers represent the best April on record, the month also saw the fewest checks of any month thus far in 2016. The trend of record-setting months began last May. In that period the background check system has seen records set for the most checks in a day, month, and year. Thus far 2016 is on pace to pass 2015 as the best year on record for gun-related background checks. The number of background checks is considered a reliable barometer for gun sales as nearly all sales made through licensed firearms dealers must by law include such a check. Some states also require a background check for gun sales between private citizens. Such checks are not an exact metric for gun sales due to a number of factors. Most states do not require the checks for private sales. Many states require the checks during their gun carry permit processes. "Based on varying state laws and purchase scenarios, a one-to-one correlation cannot be made between a firearm background check and a firearm sale," the FBI noted on their background check report. The record-setting streak has coincided with renewed calls by Democrats for new gun control measures. Both President Obama and Hillary Clinton, the presumptive nominee for the Democratic presidential nomination in 2016, have publicly expressed support for Australian-style gun confiscation regimes in the United States. Clinton has also told donors in private that she believes the Supreme Court is "wrong" about the Second Amendment. 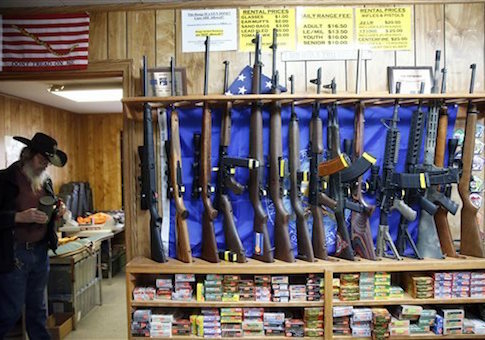 Terror attacks on American soil and abroad may also be driving gun sales. Gun rights advocates said calls for gun control from politicians such as Hillary Clinton have fueled the surging gun sales and believe the record levels will continue. "This record setting firearm sales trend will continue all the way to Election Day," said Alan Gottlieb of the Second Amendment Foundation. "If Hillary Clinton wins, firearm sales will really go through the roof. Gun owners and people concerned about personal security have lost trust in the political class to protect their rights."